Easter preparations and underway, and we want to help you stay the green path with some inspiring ideas and easy ways to make your holiday eco-friendly. We’ve rounded up some easy Easter themed DIYs and tips to keep your little bunny’s basket green. 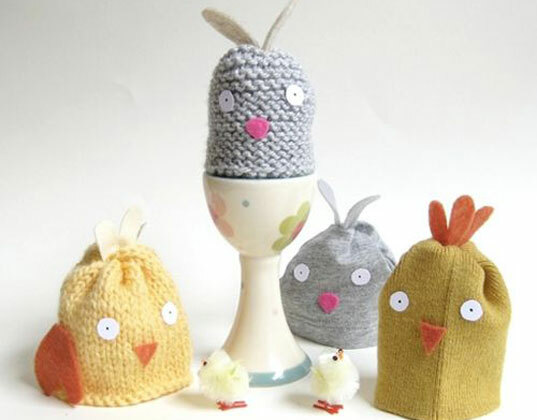 Small Magazine features an eggs-cellent tutorial on making egg cosies out of old woolen jumpers. How sweet will these chicks and bunnies look on your Easter table? LMNOP offers a basket full of ideas — chic and savvy ways to arrange Easter offerings in inexpensive basket alternatives including a spruced up, upcycled egg carton. Petite Planet highlights a DIY on making festive and colorful bunnies out of washcloths. Tuck treats inside these critters and then use the washcloths to get squeaky clean after a day of bunny hops. Growing a Green Family gives us eight tips for assembling an eco-friendly Easter basket — covering all the green bases from sustainable treats to green egg dyeing kits to organic stuffed animals! Design Mom shows us how to plant wheat grass to cushion colorful Easter eggs in true green style. Easter preparations and underway, and we want to help you stay the green path with some inspiring ideas and easy ways to make your holiday eco-friendly. We've rounded up some easy Easter themed DIYs and tips to keep your little bunny's basket green.